It’s pattern launch day! My favourite day of the month (when did this become a monthly thing? wow). My Swirls and Stripes sock pattern has now gone live over on Ravelry – if you buy it in the next week you’ll get 20% off the usual price thanks to a sweet launch discount, too! As excited as I am about that, you deserve more than just a pattern plug. I have been working on a couple of other things lately. My cable-edged cowl is tantalisingly close to being finished! It’s one of those designs where, until it’s done and the ends are joined, I can’t be 100% certain that it works the way I want it to. 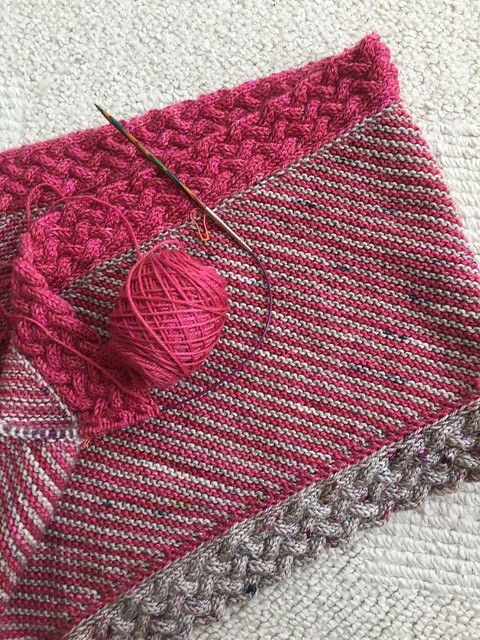 However the material it has created (using Julie Asselin Fino) is essentially total heaven – the garter section is all soft and squishy and the cables are plump and gorgeous. And I remain entirely charmed by creating double-sided, structural cables at the edges of this. Hopefully to be finished in the next week or two and then, assuming it passes muster with me, it’ll head into testing. The version I’m making is designed to be long so it can be doubled-up round the neck, but the instructions will include a short (single-loop) version too. In other news, I realised two things on Sunday evening. 1) the next Great London Yarn Crawl is this weekend (WOOHOO). And 2) I didn’t have a portable project to take with me for working on the go when travelling between shops. I mean, obviously it was going to be a sock. So I had a look at my stash, and gave in to the siren song of the Twist Sock from the Wool Barn which I bought at Fibre East last month. This is honestly the prettiest yarn I’ve bought for ages – and I wanted something appropriately pretty to show off those dainty speckles. For a change I decided that this pair would just be in the one colour – no contrast heels or cuffs, just plain and sweet knitting. A bit of sketching and a cable appeared, a bit of thinking and broken rib was added into the equation. 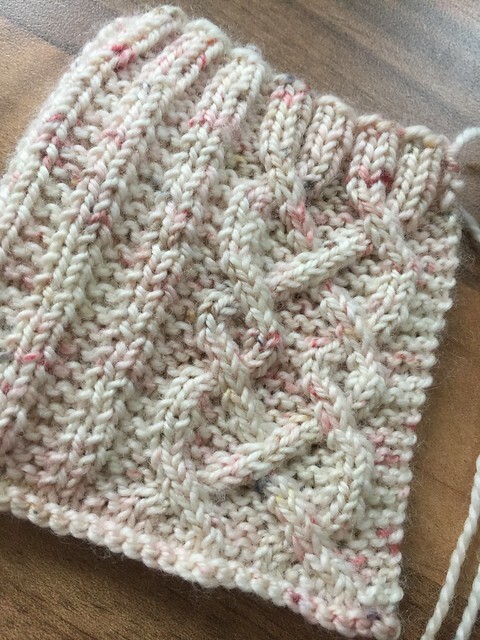 I wasn’t quite sure how the gauge would end up, so I did something I basically never do for socks, which was to create a swatch. Those socks are going to be gorgeous!!! What a great cowl WIP you’re working on. Thank you 😀 I’m very happy with how it’s turning out.